If you are outside of Canada and you wish to purchase this product - you must have a Canadian mailing address. 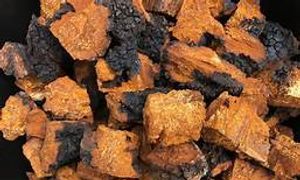 Chaga Chunks are bark-free and cut in pieces of about 1" to 1.5" in diameter. Perfect to make hot water extractions. Can be reused 3 to 4 times. Add 1/4 cup Chaga Chunks (1-2 medium chunks) to the above amount of water. Cover it up and simmer at a low temperature for up to 8 hours (Yes, that's 8 hours for a strong concoction). You could get good benefits from simmering chaga after only 5 minutes... the longer you simmer, the better and stronger! Do NOT boil your Chaga, as this will only reduce its potency. When Ready, strain into your cup or thermos holder. It's a Tea... so enjoy! Flavour is very mild and "woodsy" - excellent when served hot or iced! Add Honey, Lemon, and/or Mint for a slightly sweetened Tea. Chunks can be reused 4 to 5 times. Note that each time you reuse each brew will be a little less in strength - but it should still have a good amount of useful ingredients left. When you're done with the chunks - Let them dry and burn them as a natural incense cones - Chaga actually does have a lovely scent. Chaga Mushroom Nuggets can be consumed as a tea, added to coffee, smoothies, or your favourite recipe! Assists the Body with Emotional and Physical Stress Resistance. Chaga cell walls are made of chitin, one of the hardest off all naturally occurring materials known to date, making chaga indigestible to human beings without proper cooking. This means that for you to unlock and enjoy the amazing benefits of our chaga products, an extraction process is needed to crack the cells and release the beneficial ingredients. However, all chaga extraction methods are not equal. 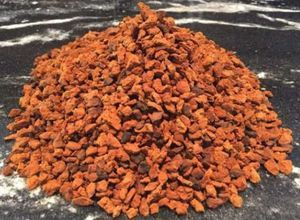 We advise our customers to use hot-water extraction method to obtain optimal benefits from our chaga products. We recommend this method because it facilitates release of all the active ingredients giving you maximum chaga tea benefits. Put some water in a clean pot, and add the Chaga product of your choice- Below is a table showing our recommended brewing quantity, brewing time, and the maximum number of reuse possible for each of our product. GRAMS/LITER OF WATER (32 fl.oz.). 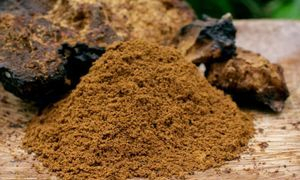 Chaga Mushroom Powder can be consumed as a tea, added to coffee, smoothies, or your favourite recipe! Place the pot on the stove and let the mixture cook on low to medium heat - We strongly recommend keeping the water below boiling point, since bringing it to a full boil (too much heat) may destroy some of the beneficial nutrients. With the Hot-Water Extraction Method, you’ll have a good powerful tea in about two to eight hours; mainly depending on whether you are using powder, nuggets, or chunks chaga. Wait until the liquid develops a rich dark color that’s similar to that of coffee. The dark color indicates that your tea is ready. Note that every time you reuse a product, you have to adjust the quantity of grams/liter as well as the brewing time to achieve the desired dark color. Strain the tea, then serve and enjoy – Don’t forget to store the Chaga chunks or nuggets in the freezer, for reuse. In case some Chaga tea is left over, do not discard it. Simply put the excess tea in a sealable container and keep it in your refrigerator. The drink can be enjoyed while warm or cold, hence, it’s not necessary to keep reheating the tea whenever you want to drink some. 100% Pure Wild Harvested Canadian Chaga Mushroom - Product of Northern Quebec. Our Raw Wild Harvested Canadian Chaga Mushroom is of the Highest Quality Canadian (Quebec) Chaga Mushroom in the World Market - Guaranteed! You get the Lowest prices within Canada! If you find a lower priced Canadian product - We will give you that price! Guaranteed! Each Northern Quebec/Canadian Chaga mushroom is harvested with love and respect for the environment so as to encourage the regrowth of the mushroom and to save the health of the trees of our beautiful Canadian forests. How to Prepare Chaga Tea Using the Hot Water Extraction Method: Using... Grams/Liter of Water - 32 fl.oz. = 946 mL/1 Liter. REUSE: 3 to 4 times. REUSE: 1 to 2 times. Additionally, if the excess amount is too much that it’s impossible to consume all of it within a few days, you can always freeze the excess. Ideally, form chaga tea ices cubes by putting some of the Chaga tea in the ice cube tray. Then, add the chaga cubes in other beverages to give them the powerful punch of Chaga’s nutrients. Note; if you intend to use your chaga to supplement other beverages, it’s best to use concentrated chaga tea, which you can easily achieve by leaving some of your Chaga tea to boil for a little longer.